A few easy-to-make appetizers and salads are the sure-fire way to satisfy those on-time guests while taking away some of the pressure for that first round of grilled delights. This recipe comes from Boston Organics’ marketing manager Coley Ward. 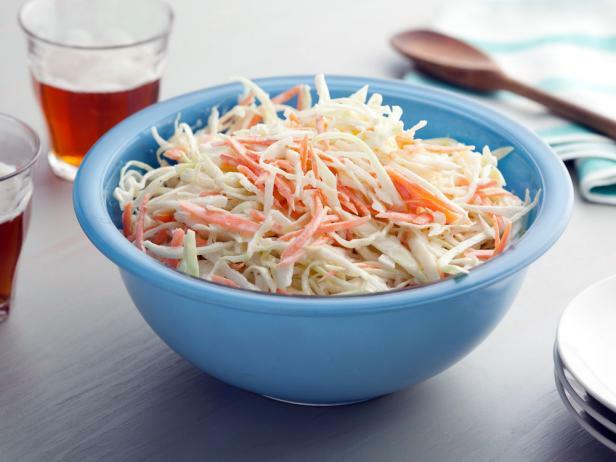 Grandma Betty’s famous coleslaw is a fast and easy way to start off your Fourth of July party while using Riverland Farm Napa cabbage and carrots. Don’t forget to salt your grated cabbage to draw out excess liquid and preserve the crunch. Also, feel free to substitute Wallaby organic plain greek yogurt in for the mayonnaise to lighten up the dish. Cut cabbage in half and into quarters. Remove bitter core in center. Cut into small enough chunks that it will fit through a food processor equipped with smallest grating blade. Grate cabbage and put in large colander. Rinse thoroughly with cold clean water. Sprinkle liberally with salt and mix. Place colander in sink or on large plate to catch drippings. Allow to sit for approximately 30 minutes. Vigorously squeeze excess liquid out of cabbage, one handful at a time. Transfer squeezed cabbage to large bowl. Grate carrots and onion on same small grater blade used for the cabbage in food processor and add to bowl with cabbage. Stir in 2 Tablespoons cider vinegar, 1 Tablespoon celery seed, and sprinkle with pepper. Add 1/4-1/3 jar mayonnaise (to your preferred taste and moisture level). Mix and adjust seasonings to taste. Will last for 2-3 days in refrigerator. The potato may be one of the most irresistible foods out there. 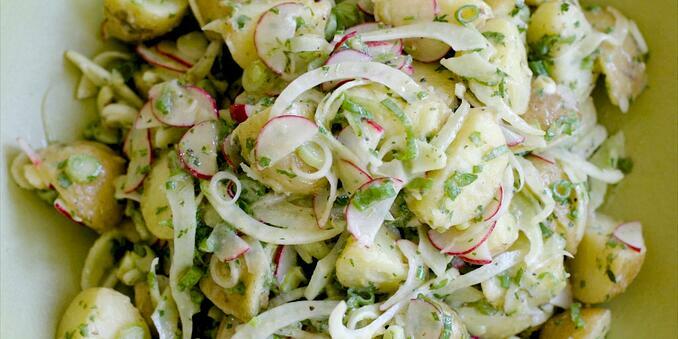 This salad utilizes fennel, fresh herbs and spicy radishes to bring brightness and flavor to your snack table this summer. For the dressing, whisk together dressing ingredients in a small bowl. Salt and pepper to taste. Set aside. For the salad, place potatoes and bay leaves in a saucepan, cover with one inch of water and salt generously. Bring water to a simmer over medium-high heat and adjust heat to maintain a simmer until potatoes can be easily pierced with a fork (about 7 to 10 minutes). Once potatoes are cooked, drain completely and pour into mixing bowl. Toss with all but two tablespoons of the dressing (save the two tablespoons of dressing for later use). Refrigerate for at least 30 minutes. After refrigerating, gently toss with chopped herbs, radishes, fennel, scallions and remaining two tablespoons of dressing. 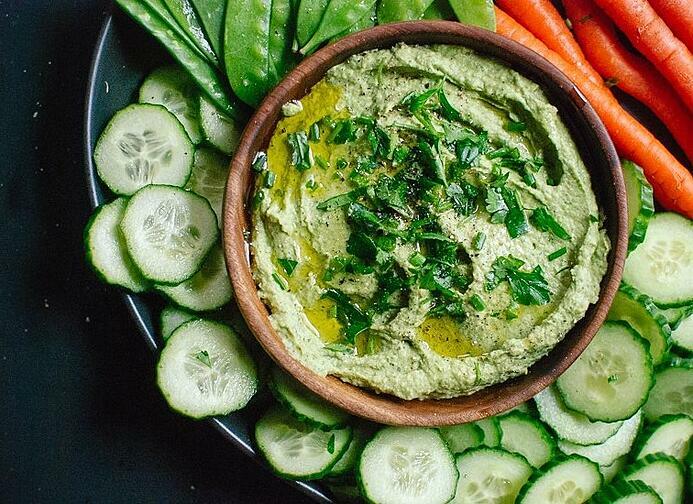 With the local vegetable season fully upon us, homemade hummus is the perfect pair for the freshly harvested carrots, radishes, broccoli, cucumbers, and zucchini coming from our growers in Western Mass. In a food processor, blend the chickpeas until they are a coarse grain. Add the tahini, garlic, ginger, lemon juice, cilantro and salt. Blend for a full minute or two. With the processor still running drizzle in the oil and then the water. For an even smoother, thinner consistency add more water. You’ve probably seen plenty of cauliflower steak recipes but cabbage steaks may be the next great thing. Slice, season, grill – it’s as simple as that but guests won’t be able to get enough of these crispy (and healthy) steaks. Choose your favorite seasoning combination or try our teriyaki cabbage steaks (pictured above). Heat a charcoal or gas grill to moderately high heat, keeping part of the grill cool for indirect grilling, and put the rack about 4 inches from the flame. Alternatively, heat a panini press or George Foreman grill according device instructions. Combine the soy sauce and mirin in a small saucepan over medium-low heat and cook until the mixture begins to bubble, 2 to 3 minutes. Remove the pan from the heat and add the ginger, garlic, and the scallions. Brush the cabbage slices with the oil and sprinkle with salt and pepper. Put the cabbage on the cool part of the grill, if using, and close the grill cover. Cook, checking and turning occasionally, until you can pierce the leaves easily with a sharp knife, 40 to 45 minutes. 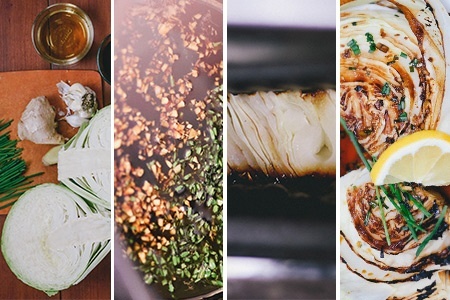 When the cabbage is tender, brush it liberally with the teriyaki mixture and move it to the hotter part of the grill. Cook, turning once or twice and brushing with more of the sauce, until it's browned, 3 to 5 minutes. If cooking with a panini press or George Foreman grill, press the cabbage wedges for about 5 minutes, flip, and repeat. When softened, remove from press and dress with sauce mixture. No barbeque is complete without the burger. 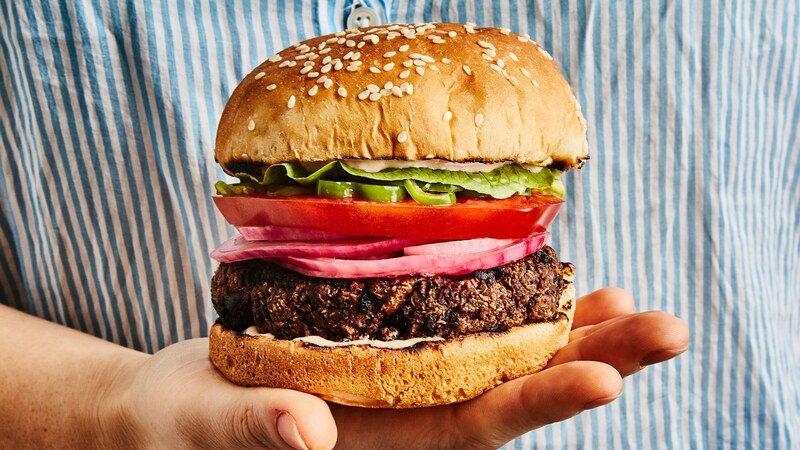 Though the perfect homemade veggie burger has proven difficult for nearly all chefs and home cooks alike, the folks over at bon appétit recently shared their solution. Check out their recipe here for a crowd-pleasing, grill-able veggie burger. Top with grilled Vidalia onions, Atlas Farm lettuce and sliced tomatoes. Shred tofu using the large holes of a box grater. Vigorously squeeze tofu in between paper towels to drain as much excess liquid as possible. Heat 2 tablespoons of oil in a large nonstick skillet over medium heat. Cook tofu and beans, stirring occasionally, until beans look slightly dried out and their skins are darkened, 10–12 minutes. While the tofu and beans cook, whisk almond butter and mayonnaise in a medium bowl until smooth. Mix in garlic, chili powder, and salt. Add tofu-bean mixture and cooked quinoa. Stir well to combine. Stir flaxseed and ¼ cup cold water in a small bowl. Let sit until a thick paste forms, about 1 minute. Add to tofu-bean mixture along with cornstarch and stir well to combine. Using oiled hands, form mixture into 8–10 patties about ½" thick. Grill until lightly charred around the edges, about 2 minutes. Turn carefully and grill until lightly charred on second side and warmed through, about 2 minutes more. Assemble burgers on lightly toasted buns, topping with grilled onions, sliced tomatoes, lettuce, condiments and/or toppings of choice. Finish your afternoon grill session with a fresh, sweet treat and solidify your backyard as the go-to party spot. 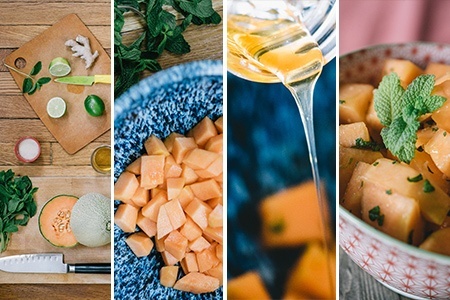 With melons coming into season, this cantaloupe, mint and lime salad is refreshing, healthy and the perfect end to any July 4th menu. Cut cantaloupe into 3/4- to 1-inch cubes (about 5 cups) and place in large bowl. Add lime juice, mint and grated lime peel. Toss to blend. Mix in sugar, ginger, and honey. Refrigerate salad until ready to serve, stirring occasionally, up to 3 hours.